1. Using a pastry cutter or two knives, cut butter into flour until mixture resembles coarse crumbs. Stir in sour cream. Transfer mixture to a lightly floured surface and knead until dough holds together. 2. Flatten dough into a 8 x 6-inch rectangle. Wrap in plastic wrap and refrigerate at least 2-1/2 hours or overnight. Sprinkle 1/2 cup sugar onto work surface. Divide dough in half. 3. Wrap half of the dough in plastic wrap and return to refrigerator. 4. Roll the remaining half of dough out on the sugared surface to form a 14-inch square. Using side of hand, make an indentation down center of dough. Starting at one side, tightly roll dough until it reaches indentation. 5. Repeat with other side, incorporating as much sugar as possible into dough. Wrap roll tightly in plastic wrap and stand up inside a tall drinking glass to keep from flattening on the refrigerator shelf. Repeat with second half of dough and remaining sugar. Refrigerate 2 hours or up to 3 days, or freeze up to 3 weeks. 6. Pre-heat oven to 350 F. With serrated knife, cut rolls crosswise into 1/4 inch thick slices. Return rolls to refrigerator if the dough becomes too soft to slice. Place slices 2 inches apart on an ungreased cookie sheet. 7. Bake 10 minutes; carefully turn cookies over and bake 5 minutes longer or until sugar has caramelized and cookies are deep golden. Let cookies remain on cookie sheet on wire rack 1 minute to cool slightly. Transfer cookies to wire rack to cool completely. Store cookies in an airtight container for up to 1 week. 1. Heat oven to 375º. Lightly grease cookie sheet. Sprinkle sugar over kitchen counter or breadboard. Roll pastry into 1/8-inch-thick rectangle, 12 × 9 1/2 inches, on sugared surface. 2. Mark a line lengthwise down center of rectangle. Fold long sides of rectangle toward center line, leaving 1/4 inch uncovered at center. Fold rectangle lengthwise in half to form strip, 12 × 2 1/2 inches, lightly pressing pastry together. 3. Cut strip crosswise into 1/4-inch slices. Coat both sides of slices with 1/2 cup sugar. Place about 2 inches apart on cookie sheet. 4. Bake 8 to 10 minutes, turning after 5 minutes, until cookies begin to turn golden brown. Immediately remove from cookie sheet to wire rack. 5. Cool completely. Dip ends of cookies into melted chocolate. Place on waxed paper until chocolate is firm. 1. Heat oven to 375º. Beat sugar, oil, eggs and vanilla in large bowl with electric mixer on medium speed, or mix with spoon. Stir in flour, baking powder and salt. Stir in candies. 2. Drop dough by rounded teaspoonfuls about 2 inches apart onto ungreased cookie sheet. Bake 8 to 10 minutes or until edges are light brown. Remove from cookie sheet to wire rack. 1. Heat oven to 375º. Beat 1 cup sugar, the shortening and eggs in large bowl with electric mixer on medium speed, or mix with spoon. Stir in flour, baking powder and salt. 3. Roll half of dough at a time 1/8 inch thick on lightly floured cloth-covered surface. Cut into 3-inch rounds. Place 1 level teaspoon filling on center of each round. 3. Bring three sides of each round together at center to form triangle. Pinch edges together to form 3 slight ridges. Place on ungreased cookie sheet. Sprinkle with sugar. 4. Bake 9 to 12 minutes or until golden brown. Cool 1 to 2 minutes; remove from cookie sheet to wire rack. 1. Heat oven to 350º. Beat sugars, shortening, peanut butter and egg in large bowl with electric mixer on medium speed, or mix with spoon. 2. Stir in flour, baking soda and baking powder. 3. Reserve 1 cup dough. Press remaining dough in ungreased rectangular pan, 13 × 9 × 2 inches. Spread with jam. Crumble reserved dough and sprinkle over jam; gently press into jam. 4. Bake 20 to 25 minutes or until golden brown. Cool completely. 5. Drizzle with Vanilla Drizzle. Cut into 8 rows by 4 rows. Melt butter in 1-quart saucepan over low heat; remove from heat. Stir in powdered sugar and vanilla. Stir in hot water, 1 teaspoon at a time, until smooth and thin enough to drizzle. 1. Heat oven to 375º. Grease rectangular pan, 13 × 9 × 2 inches. Mix cake mix (dry), butter and egg in large bowl with spoon (mixture will be stiff). Press evenly in pan, flouring fingers if necessary. 2. Microwave jelly in microwavable bowl uncovered on Medium (50%) 1 minute. Spread evenly over mixture in pan to within 1/2 inch of edges. Sprinkle peanut butter chips over jelly. 3. Bake 25 to 30 minutes or until golden brown around edges. Cool completely. Cut into 8 rows by 4 rows. For easier cutting, use sharp or wet knife. 1. Heat oven to 375º. Beat 1/2 cup granulated sugar, the brown sugar, peanut butter, butter, shortening and egg in large bowl with electric mixer on medium speed, or mix with spoon. 2. Stir in flour, baking soda, baking powder and salt. Shape dough into 1 1/4-inch balls. 3. Place about 3 inches apart on ungreased cookie sheet. Flatten slightly in crisscross pattern with fork or potato masher dipped into granulated sugar. 4. Bake 9 to 10 minutes or until light brown. Cool 5 minutes; remove from cookie sheet to wire rack. 1. Heat oven to 375º. Empty cookie mix into large bowl. Break up lumps in mix with spoon. Stir in oil and egg until soft dough forms. 2. Divide dough into thirds. Shape one-third dough by tablespoonfuls around 3 miniature marshmallows. Shape one-third dough by tablespoonfuls around 1 peanut butter cup. Shape one-third dough by tablespoonfuls around 1 candy ball. Roll each ball in sugar. 3. Place about 2 inches apart on ungreased cookie sheet. Bake 7 to 9 minutes or until light golden brown. Cool 1 to 2 minutes; remove from cookie sheet to wire rack. 1. Heat oven to 350º. Grease square pan, 9 × 9 × 2 inches. Beat sugars, butter, milk and eggs in large bowl with electric mixer on medium speed, or mix with spoon. 2. Stir in flour, baking powder and salt. Divide batter in half (about 1 cup plus 2 tablespoons for each half). Stir peanut butter and peanut butter chips into one half. Stir cocoa and chocolate chips into remaining half. 3. Spoon chocolate batter into pan in 8 mounds in checkerboard pattern. Spoon peanut butter batter between mounds of chocolate batter. 4. Gently swirl through batters with knife for marbled design. 5. Bake 30 to 35 minutes or until toothpick inserted in center comes out clean. Cool completely. Cut into 4 rows by 4 rows. 1. Heat oven to 350º. Grease and flour jelly roll pan, 15 1/2 × 10 1/2 × 1 inch. 2. Mix cake mix (dry), peanut butter, water and eggs in large bowl with spoon. Stir in almond brickle chips. Spread evenly in pan. 3. Bake 20 to 25 minutes or until golden brown. Immediately sprinkle chocolate chips over hot bars. 4. Let stand about 5 minutes or until chips are melted; spread evenly. Cool completely. Cut into 10 rows by 6 rows. 1. Heat oven to 375º. Beat half of the cake mix (dry), the water, butter, peanut butter and eggs in large bowl with electric mixer on medium speed until smooth, or mix with spoon. 2. Stir in remaining cake mix and the chocolate chips. 3. Drop dough by rounded teaspoonfuls about 2 inches apart onto ungreased cookie sheet. 4. Bake 8 to 10 minutes (centers will be soft). Cool 1 minute; remove from cookie sheet to wire rack. 1. Spray square pan, 9 × 9 × 2 inches, with cooking spray. Heat marshmallows and butter in 3-quart saucepan over low heat, stirring constantly, until marshmallows are melted and mixture is smooth; remove from heat. 2. Stir in vanilla. Stir in half of the cereal at a time until evenly coated. 3. Press in pan; cool. Cut into 6 rows by 6 rows. 1. Cream butter, peanut butter and both kinds of sugar. Beat in egg and vanilla. 2. Sift together flour, baking soda and salt. Blend into creamed mixture to make a dough. 3. Preheat oven to 375. Shape dough into 1/2 inch balls and place in ungreased 1 1/2 inch muffin tins. 4. Bake 8-10 minutes or until lightly browned. Immediately after removing cookies from oven, press a miniature peanut butter cup into the center of each cookie until only the top shows. Let cool 10 minutes before removing from tins. 1. Heat oven to 375º. Mix sugar and pecans in large bowl; reserve 3/4 cup. 2. Beat butter, vanilla and eggs into remaining sugar mixture with electric mixer on low speed, or mix with spoon. Stir in flour, baking powder and salt. 3. Roll dough into rectangle, 18 × 13 inches, on lightly floured surface. Sprinkle with reserved sugar mixture. Press sugar mixture into dough with rolling pin. 4. 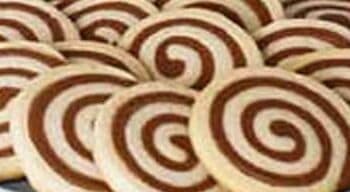 Cut dough diagonally every 2 inches in both directions with pastry wheel or knife to form diamonds. 5. Place about 2 inches apart on ungreased cookie sheet. Bake 8 to 10 minutes or until golden brown. Immediately remove from cookie sheet to wire rack. 1. Preheat oven to 350°F. Lightly grease a 9×13-inch baking pan; set aside. Set aside second measure of the cake mix for the filling. 2. For the crust, in a large mixing bowl combine remaining cake mix, butter, and slightly beaten egg. Stir with a fork until crumbly. Turn into prepared pan. 3. With lightly floured hands, press evenly onto the bottom to form a crust. 5. Meanwhile, for filling, in a medium bowl combine the second measure of eggs, brown sugar, corn syrup and vanilla. Add the reserved cake mix; stir with a fork just until blended. Some tiny cake clumps will remain. 6. Spread filling evenly over baked crust; sprinkle with pecans. 7. Bake for 25 – 30 minutes or until filling appears set when pan is gently shaken. Cool completely on wire rack. Cut into bars. Cover and chill to store. 1. Heat oven to 350º. Grease jelly roll pan, 15 1/2 × 10 1/2 × 1 inch. 2. Beat flour, butter, sugar and salt in large bowl with electric mixer on low speed until crumbly (mixture will be dry). Press firmly in pan. 3. Bake about 20 minutes or until light golden brown. 4. Pour Filling over baked layer; spread evenly. Bake about 25 minutes or until filling is set. Cool completely. Cut into 10 rows by 6 rows. Mix all ingredients except pecans in large bowl until well blended. Stir in pecans. 1. In a mixing bowl, beat egg whites until foamy. Sprinkle with salt and cream of tartar; beat until soft peaks form. Gradually add sugar, beating until stiff peaks form, about 7 minutes. 2. Drop by teaspoonsful onto ungreased foil or paper-lined baking sheets; sprinkle with the crushed candy. 3. Bake at 225 degreesF for 1 1/2 hours. 4. 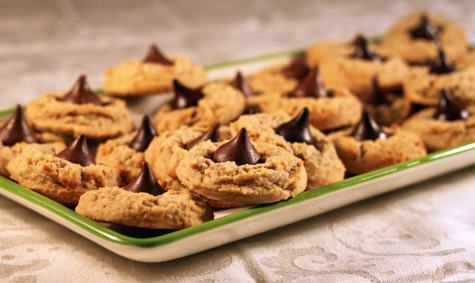 Turn off heat; leave cookies in the oven with the door ajar for at least 1 hour or until cool. Store in an airtight container. 2. In a food processor finely grind peppermint candies and 1/3 cup sugar to a powdery consistency; transfer to a small bowl. 3. In a large bowl, cream butter, shortening, and remaining 1 cup sugar until fluffy. Add eggs and extracts; beat until smooth. 3. In a medium bowl, combine flour and salt. Add dry ingredients to creamed mixture; stir until a soft dough forms. Shape dough into 1-inch balls. 4. Roll balls in candy mixture. For best results, place 6 cookies at a time on an ungreased baking sheet. 5. Bake 8 minutes; immediately roll hot cookies in candy mixture. Transfer to a wire rack to cool completely. Repeat with remaining dough. 1. Heat oven to 375º. Beat sugar, butter, sour cream, egg and pineapple in large bowl with electric mixer on medium speed, or mix with spoon. 2. Stir in flour, baking soda, vanilla and salt. Stir in almonds. 4. Bake 8 to 10 minutes or until almost no indentation remains when touched in center. Immediately remove from cookie sheet to wire rack. Cool completely. 5. Spread with Vanilla Glaze. 1. Beat powdered sugar, butter and egg in large bowl with electric mixer on medium speed, or mix with spoon. Stir in flour and salt. 2. Divide dough in half. Stir cocoa and milk into one half. Stir nuts and food color into other half. 3. Pat chocolate dough into rectangle, 6 × 5 inches. Cut crosswise into 8 strips, 3/4 inch wide. Repeat with pistachio dough. Place 2 strips of each color of dough side by side, alternating colors. Top with 2 strips of each dough, alternating colors to create checkerboard. Gently press strips together. Repeat with remaining strips to make second rectangle. 4. rap and refrigerate about 2 hours or until firm. 5. Heat oven to 375º. Cut rectangles crosswise into 1/4-inch slices. Place about 1 inch apart on ungreased cookie sheet. 6. Bake 8 to 10 minutes or until set. Remove from cookie sheet to wire rack. 1. Preheat oven to 325 F. Combine butter, sugar and egg; beat until thoroughly blended. Stir in flour and salt. 2. Spread one-half of dough into 9 inch square pan. Bake 10 minutes; remove from oven. Spread jam to within 1/2 inch of edge. Add pistachios to remaining dough. 3. Drop by spoonfuls over jam to cover. 4. Bake 35 minutes until top is golden brown; cool. Cut into squares. 1. Heat pizzelle iron according to manufacturer’s directions. Mix all ingredients in a medium bowl. 2. Drop 1 tablespoon batter onto heated pizzelle iron; close. Cook about 30 seconds or until golden brown. 3. Carefully remove pizzelle from iron. Cool on wire rack. Repeat for each cookie. 1. Cream butter in a large bowl with an electric mixer. Add confectioners’ sugar; beat well. Beat in the egg and extracts. Blend in the flour and salt. 2. Form the dough into two disks and wrap them in plastic. Chill the dough well. 3. Remove one disk from the refrigerator. Roll dough out on a lightly floured surface to 1/8-inch thickness. Cut into 1 1/2-inch squares, then cut from each corner of the square almost to the center. 4. Turn over every other cut point to the center and press gently, forming a pinwheel (or poinsettia). 5. Sprinkle the center of each with red sugar. Repeat with the second disk of dough. 6. Preheat oven to 350 degrees F. Place the cookies on greased baking sheets and bake until very lightly golden, about 8 to 10 minutes. 1. Heat oven to 375º. Beat sugar, butter and egg in large bowl with electric mixer on medium speed, or mix with spoon. 2. Stir in flour, poppy seed, baking powder and salt. 3. Drop dough by rounded tablespoonfuls about 2 inches apart onto ungreased cookie sheet. Bake 10 to 12 minutes or until edges are golden brown. Cool 1 to 2 minutes; remove from cookie sheet to wire rack. 4. Cool completely. Drizzle with Poppy Seed Glaze. 1. Pre-heat oven to 350 F. Beat oil and sugar in mixing bowl. Add eggs and vanilla, beating well. 2. Sift flour, baking powder, baking soda, spices, and salt together. Add to sugar mixture alternately with pumpkin, beating well after each addition. 3. 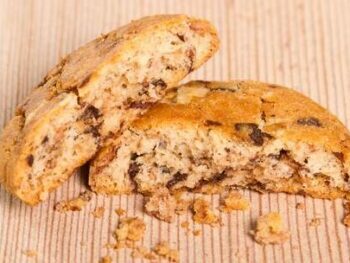 Fold in chocolate chips and nuts. Drop by teaspoonfuls onto greased cookie sheets. 4. Bake for 10 to 12 minutes or until golden brown. Cool on wire rack. 1. Heat oven to 350º. Grease jelly roll pan, 15 1/2 × 10 1/2 × 1 inch. Mix eggs, sugar, oil and pumpkin in large bowl with spoon. 2. Stir in flour, baking powder, cinnamon, baking soda, salt, ginger and cloves. Stir in raisins. 3. Spread batter in pan. Bake 25 to 30 minutes or until toothpick inserted in center comes out clean. Cool completely. 4. Frost with Cream Cheese Frosting. Sprinkle with nuts. Cut into 8 rows by 6 rows. Store covered in refrigerator. 1. Preheat oven to 350° F. Combine flour, rolled oats and ½ cup brown sugar with ½ cup butter. Put in mixing bowl and blend with electric mixer at low speed until crumbly. 2. Press into the bottom of an ungreased 9 x 13-inch pan. Bake 15 to 20 minutes. 3. Combine pumpkin, evaporated milk, eggs, sugar, salt and spices in mixing bowl, mix well. Pour over baked bottom and bake 20 minutes more. 4. Combine pecans, brown sugar and 2 tablespoons butter. Sprinkle over pumpkin mixture. 5. Put back in oven for 15 to 20 minutes or until set. Cool and cut into squares. 1. Preheat oven to 400 F. In a large mixing bowl beat butter until creamy; beat in sugar and spices until well combined. 2. Mix in pumpkin, egg and vanilla until well combined. In a separate bowl, stir together flour and baking powder. Stir flour mixture into butter mixture until well combined. 3. 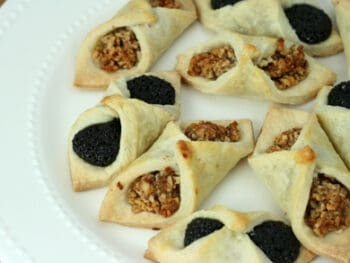 Place into a cookie press and press out shapes onto an ungreased baking sheet (for best results use a silver-colored baking sheet, not the kind with a non-stick surface). Lightly sprinkle cookies with additional nutmeg. 4. Bake 6 to 8 minutes or until set but not browned. Allow to cool 2 minutes on baking sheet then remove to wire racks to cool completely.